Sidewalks, pedestrian paths, wide shoulders and bus stops were prohibited (photo examples below), despite huge detours that were forced upon walkers [see map]. These detours greatly increased danger by forcing unnecessary crossings of intersections, the greatest source of danger for walkers. 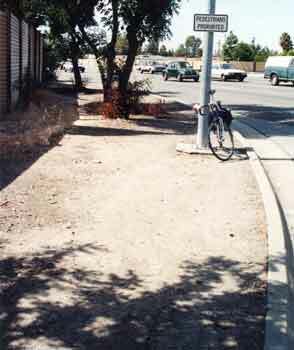 Photographs were taken along Capitol Expressway in San Jose in June, 1997 by Akos Szoboszlay. County highway engineers had stonewalled on removal of signs "prohibiting" use of sidewalks for years. 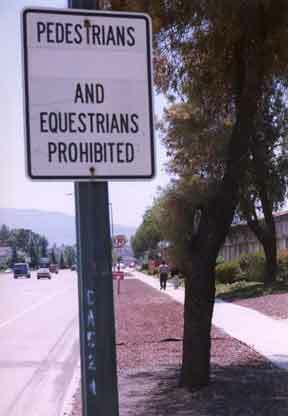 This sign was only removed in 1997 after I showed these photos to the County Supervisors. 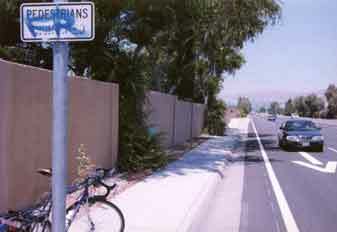 Notice the word "bicycles" was taped over and a "bike lane" sign (see detail) added. There was no other change to the road, so this means that "bicycles" were "prohibited" from the "bike lane" on this roadway, for about 15 years! Notice defaced "PEDESTRIANS PROHIBITED" sign, third photo. Bus stops were "PROHIBITED." The enlargement (right) shows path, also prohibited, to reach this bus stop.Even the Capitol Light Rail Station was "PROHIBITED" to most. Practically speaking, the highway engineers only allowed transit patrons to use the LRT station if they owned a car and drove it to the park-and-ride lot. 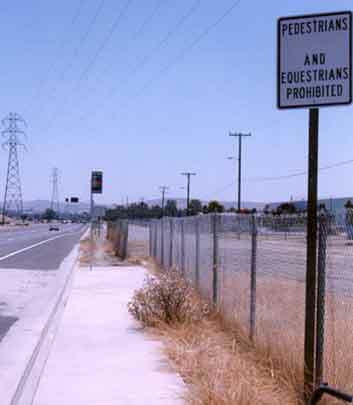 The County highway engineers refuse to remove the sign that "prohibits" the above pedestrian despite the County's legal opinion that this sign is illegal. This pedestrian, walking on the pedestrian path, must walk passed the "PEDESTRIANS PROHIBITED" sign and risk a ticket of about $120. Notice the extra wide shoulder/bike lane (where they previously banned bicycles). The speed limit is 45 mph, same as many other roads lacking paved sidewalks. Detail at intersection. At all intersections areas of Capitol Expressway, pedestrians walk on a pathway even where between intersections they may use a shoulder. Here, the pedestrian path extends for the entire length of the block, but the highway engineers continue to refuse to remove the sign "PEDESTRIANS PROHIBITED." The latest struggles --and victories-- to allow pedestrians are on our expressway topics page. For a history of prohibitions of bicycles and destructions of streetcars and electric trains, see Conflict of Transportation Competitors. Read about the 10-year struggle to allow pedestrians, transit access on "expressways" in Santa Clara County (California, USA). Read about the struggle on Capitol "Expressway." For more information, or to help out, please contact Akos Szoboszlay. Related topic: See pictures and articles on the fight to allow bicycles on shoulders of bridges crossing San Francisco Bay at www.xinet.com/bike.